I’m gearing up to cook my way back through some of the recipes in Power Plates, having been apart from them for over a year now. This means that one-bowl/one-skillet/one-pot/one-plate meals are very much on my mind. 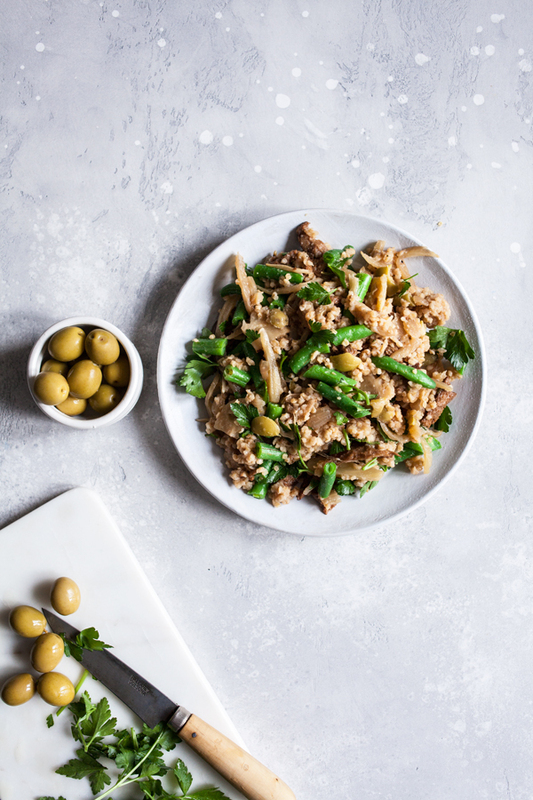 I experimented with this skillet seitan and bulgur with fennel & olives on Monday night, hoping that it would be a quick, protein-rich, flavorful meal for weeknights, and I think it came through! Funnily enough, I cook with all of these things routinely now, and some of them—greens and legumes especially—are among my favorite foods. Spicy things and alliums took longer, and so did olives, which for a long time were super foreign to me in their all of their wonderful, briny saltiness. I use olives often now, not just for snacking or finger food, but also as a way to add flavor punch to pasta dishes and grain salads. This shift has really only happened in the last year or two, but it’s giving me access to lots of new recipe options and ideas. 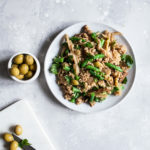 I’m just branching out into using olives regularly in my cooking (as opposed to folding them into cold dishes), and this single skillet meal of seitan and bulgur was a nice contribution to my small, but growing repertoire. 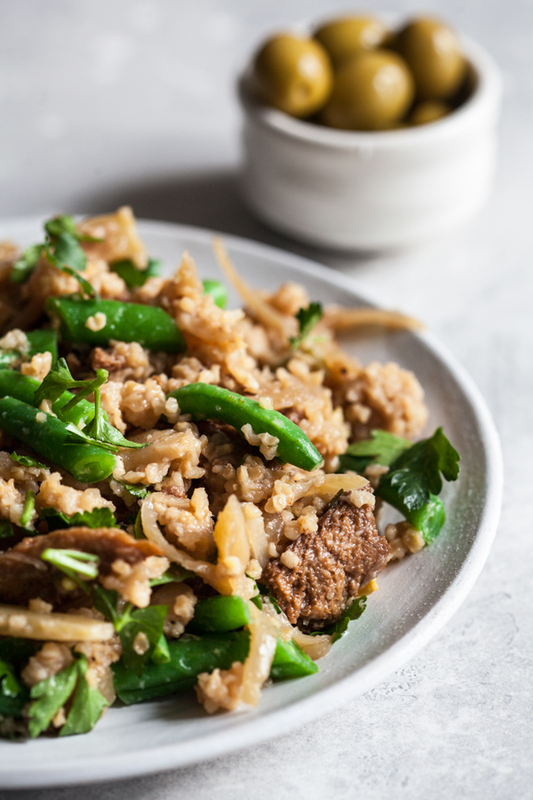 I’ve been finding blackbird seitan locally lately, and I’m in love with it, so it was the plant protein I wanted to shape this meal around. 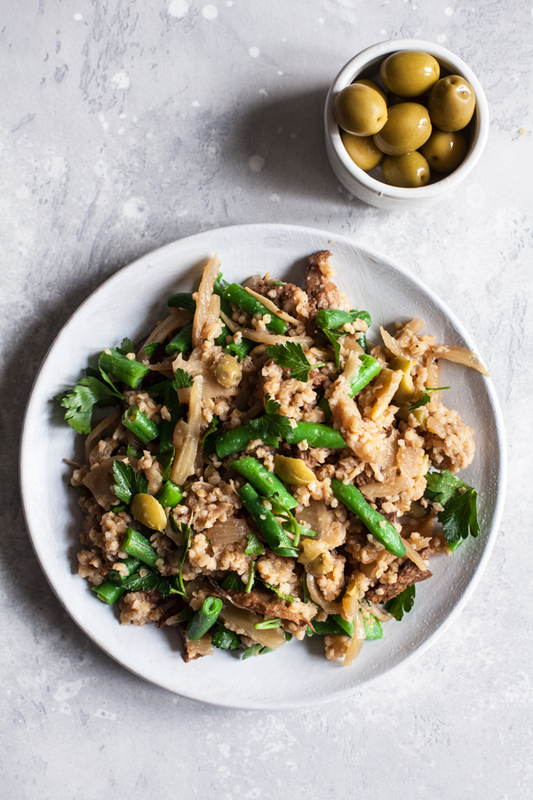 I picked bulgur as a grain because it cooks so quickly (and is itself a good source of protein and fiber), and I was set on using fennel in the meal because I suspected its sweet flavor would be a nice compliment to the salty olives. The recipe comes together in about 25 minutes once everything is prepped and started, and it’s easy to modify. As written, it’s a wheat-y meal, but you could make it gluten free by subbing the seitan for my chick’n style soy curls or another, gluten-free vegan chick’n of choice, then using quinoa in place of bulgur. 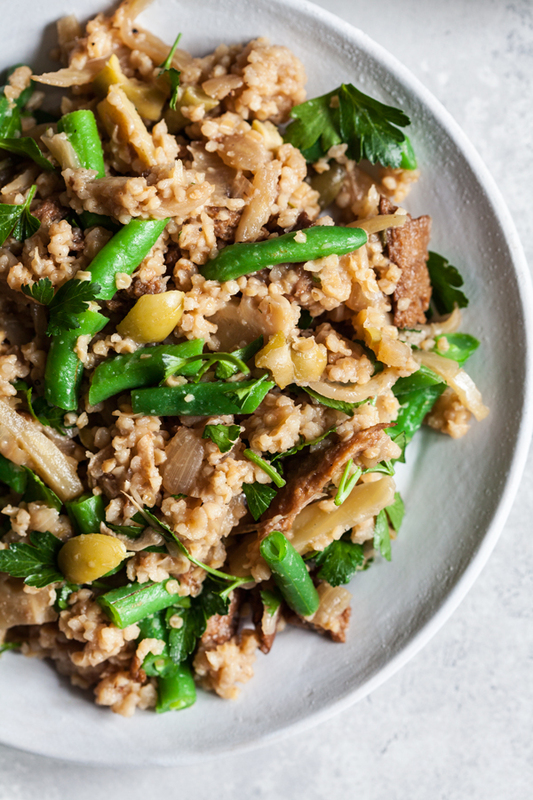 If you’re not gluten free but don’t have bulgur at home, you could use couscous in its place, in which case dinner will be ready even faster. In the end, you’ll have a textured, nutritious meal that’s packed with the taste of olives, a bit of white wine, plenty of garlic, and some sherry vinegar. The flavors give a nod to Spanish cooking, since I used chamomile, or manzanilla, olives from Spain. These green olives have a firm texture, which makes them perfect for cooking with, plus a smoky flavor that I love. I’ve gotten to know them through collaborating with the folks behind the “Have an Olive Day” campaign, which is dedicated to spreading awareness of the culinary versatility of all different olive varieties, as well as their history within Mediterranean diet and culture. If you’re still learning about the many types of olives, like I am, their website has a guide different varieties, as well as tons of recipes to use as inspiration. You can also get more inspiration via their Twitter, Facebook, and Instagram pages. 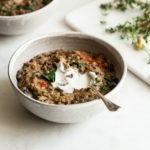 In the meantime, here’s a vegan meal that’s packed with olives and other plant-based goodness! Heat the oil in a large, deep skillet (one with a lid) over medium heat. Add the onion and fennel. Cook for five minutes, stirring now and then, or until the vegetables are soft. Add the garlic and cook for one more minute, stirring constantly. Add the seitan to the skillet, then add the white wine. Raise the heat to medium high and cook everything, stirring frequently, for another 4-5 minutes, or until the wine has mostly evaporated. Add the bulgur, green beans, olives, salt, paprika, rosemary, and water to the skillet. Bring the water to a boil, then reduce the heat to low. Cover the skillet and simmer for 15 minutes. Check to be sure the bulgur is tender. If it's still a little firm, give it another 3-5 minutes. Stir in the parsley, pepper, and a nice splash of sherry vinegar. Adjust salt as needed, then serve. 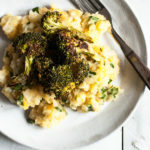 I love how hearty this meal is—a good option for these chilly days when I’ve had more than my fill of soup and stew. 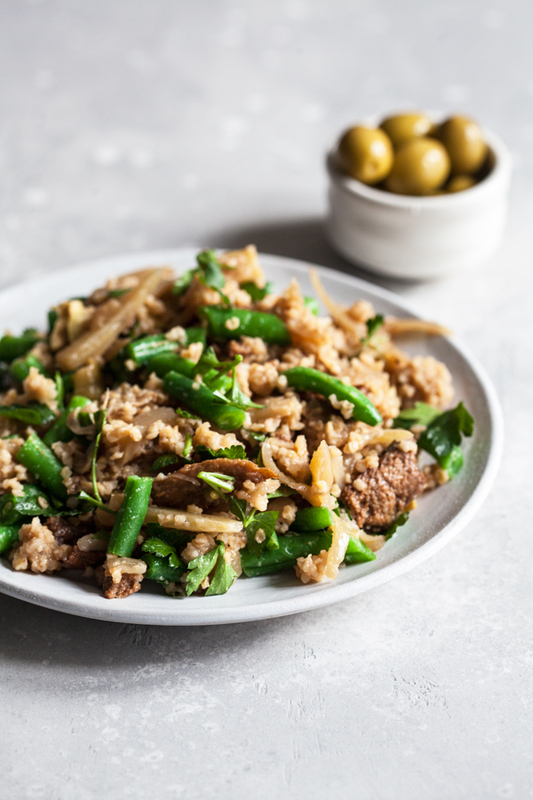 The bulgur and seitan give it a lot of texture, and the green beans and herbs are a necessary counterpart to all of the earthy flavors in the rest of the dish. I’m pretty sure that this recipe fits the brown food rule: doesn’t photograph prettily, but always seems to taste the best. Anyway, it’s nutritious and filling and makes great leftovers, and I’m happy to have it near me this week as I continue to chug my way into a busy semester. Wishing you all warmth and nourishment. I’ll be back on Friday with a recipe from Power Plates that’s perfect for Superbowl entertaining (or just a comfort food fix). Till soon! This post is sponsored by the Have an Olive Day campaign. All opinions are my own. Thanks for your support!